There are always cases when we need to have some hosts in testbed networks for verifying the network connectivity during network migration plan tests. I am a fans of Dynamips/Dynagen. The hosts in the 1st network setup can always be emulated using routers with IP routing disabled, configured with the "ip default-gateway" command instead of "ip route 0.0.0.0 0.0.0.0" command. The challenge arose when I am involving in many testings and POCs on the Nexus platform switches due to the boom of the 10G data center networking and cloud, which means involving physical switches, and physical hosts. An efficient approach is relying upon the Virtual Device Context (VDC) concept in the Nexus 7000 Series switches, in which a physical switch can be divided into multiple logical switches, and assigning interfaces to the different logical switches, or what we called context. 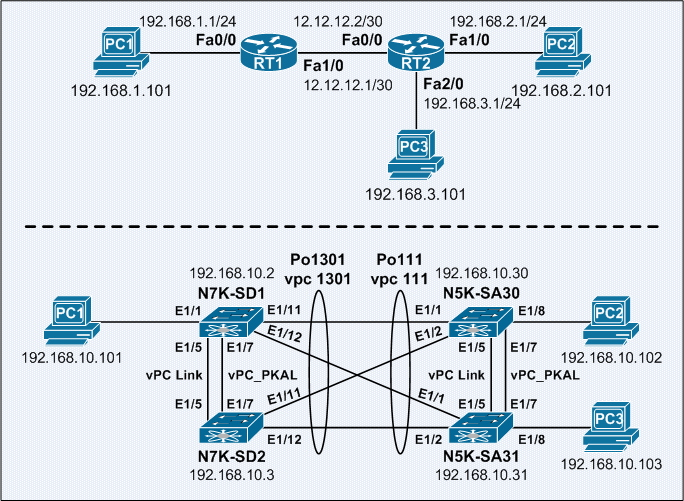 This concept can also be implemented using Virtual Routing and Forwarding (VRF), which is able to assign interfaces to different virtual routers, with their own routing tables.